The new standard for workgroup printing. HP's commitment to practical, enabling innovation has made it the industry standard in laser printing for over 13 years. HP LaserJet 4000 series printers set yet another benchmark, affording you the latest in network printing technology backed by unparalleled quality, reliability and compatibility. HP LaserJet 4000 series printers bring significant technology improvements to workgroup laser printing. From paper handling to print quality, HP has completely redesigned the best-selling HP LaserJet 5 printer based on customer needs. What you'll find is a superior network printing solution that includes industry-leading HP JetDirect 600N print servers and HP Web JetAdmin printer management software. All are part of a long tradition of expertly engineered hardcopy products from Hewlett-Packard that are designed to work together -- to give you the absolute best in network printing. New 17-page-per-minute (ppm) engine and 100-MHz RISC processor outperform other laser printers. Instant-on fuser gives 15-second startup, even from Powersave mode. Two 32-bit PCI-based Enhanced I/O (EIO) slots deliver faster throughput and greater flexibility. 600-sheet standard capacity reduces paper restocking. Additional input sources (one 100-sheet tray plus either one 500-sheet tray or two 250- sheet trays) let you print on multiple paper sizes without swapping trays. Straight-through paper path lets you use a wider variety of paper sizes and weights, and eliminates curling of heavier media and envelopes. HP FastRes 1200 (printer default mode) prints 1200-dpi quality at the same speed as 600-dpi and with standard memory. HP ProRes 1200 gives you true 1200-dpi output. HP UltraPrecise toner uses 5-micron particles (less than one-half the size of most other brands) for more accurate dot placement, enhanced grayscale and photo-like quality. HP Internet Installer and Oil Change for HP Customers give you automatic access to the latest printer drivers. HP PCL 5e, HP PCL 6 and PostScript Level 2 Emulation ensure compatibility with both PC and Macintosh files. HP JetAssist Connector lets you easily add HP and third-party paper handling accessories. HP JetSend allows direct communication between printers, scanners and other information appliances without using the PC as the intermediary. New DIMM memory modules are smaller, more powerful and easier to add to the printer. 17-ppm engine and 100-MHz RISC processor for faster printing. HP PCL 6 and PostScript Level 2 Emulation ensure compatibility. HP Transmit Once for reduced network traffic and faster return to applicaton times. Two open EIO slots for HP JetDirect 600N print servers or third-party solutions. Improved drivers, with intuitive interfaces and automatic Internet update capability. HP JetAdmin and HP Web JetAdmin printer management software for easy installation and management. 600-sheet standard input capacity reduces restocking. 4 Mbytes memory and Memory Enhancement technology (MEt). New 10,000-page HP UltraPreciseTM toner cartridge reduces the cost of output. 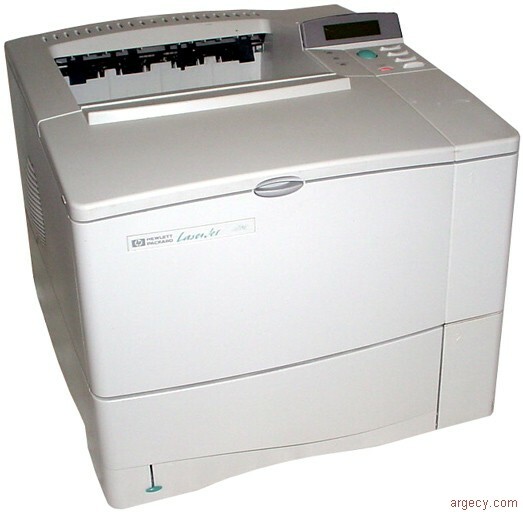 The HP LaserJet 4000 printer is a solid foundation for your printing needs.